The need for Bibles in Cuba is urgent as 40% of believers do not have a Bible, many sharing one Bible between a whole Bible study group. Furthermore, many who do have Bibles find that they are old and so well used that they are in a very poor condition. The One Million Bible Mission project will work with churches from all denominations to distribute Bibles to Christians in Cuba who desperately want their own copy of God’s word. The Bible Commission (the name for the Bible Society in Cuba) are also providing scriptures for children and youth, and large print Bibles for the elderly. Only Bibles donated through Bible Societies around the world are allowed into Cuba. Pray for the import and distribution of Bibles into Cuba, and that everyone desperately waiting will soon experience the joy of having their own copy of God’s word. The need for Bibles in Cuba is urgent as 40% of believers do not have a Bible – many sharing one Bible between a whole Bible study group. And many who do have Bibles find that they are old and so well used that they are in a very poor condition. The ‘One Million Bible Mission’ project will work with churches from all denominations to distribute Bibles to Christians in Cuba who desperately want their own copy of God’s Word. The Bible Commission (the name for the Bible Society in Cuba) are also providing Scriptures for children and youth, and large print Bibles for the elderly. Only Bibles donated through Bible Societies around the world are allowed into Cuba. Pray for the import and distribution of Bibles into Cuba, and that everyone desperately waiting will soon experience the joy of having their own copy of God’s Word. The Ladies in White are a tremendously brave group of female human rights activists who, every Sunday, peacefully protest the imprisonment of human rights defenders. For this, they are blocked from attending religious activities including Mass, put under house arrest, interrogated and even beaten. Pray that God would grant them renewed courage and endurance. Cuba has seen unprecedented church growth in recent years. According to estimates, the evangelical church is currently growing at a rate of 10-25% per year in the country. While the island nation has a number of seminaries, a significant number of lay leaders have had little or no Bible training, and many believers do not own a copy of the Bible, forcing them to share. In response to this need, UBS (comprising some 146 Bible Societies worldwide) has joined with the Bible Commission of Cuba to launch a campaign called the ‘Million Bible Mission’. The goal is to provide 1 million Bibles for Cubans as well as resources and leadership training to support the growing church. This last outpost of Communism in the West continues to create difficulties for the Church there. Foreign missions are largely restricted and there is disunity amongst the Christian denominations in the country. There is also a desperate need for trained counsellors in Cuba, and in the autumn eight locations around the country began counselling training. There are now plans for several resource centres to be launched in various regions of Cuba to equip ministry facilitators serving in family counselling, education and leadership. Pray that these Centres will be able to function without persecution and will be a channel for God’s peace and love. 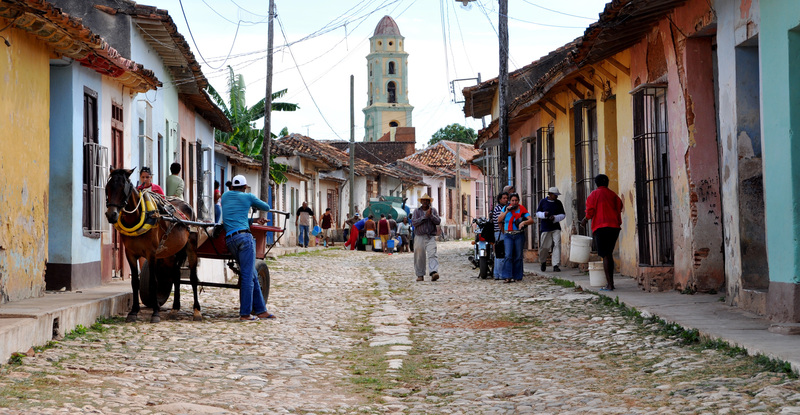 Intensive theology training courses are having an impact on the church in Cuba. Cuban pastors are teaching other pastors, house church leaders, Sunday school teachers and youth ministers, who then promise to teach what they've learnt to others. In one recent case, two tutors taught 26 people who have promised to pass on the teaching to 163 other people in their respective churches. Pray for funding to continue this exciting work, and pray that the knowledge being shared will truly strengthen the Cuban church. Situated only 90 miles from the Florida coast, in recent decades Cuba has suffered under hostile American political policies, including trade embargoes and migration restrictions. For many years the country’s predominantly Catholic culture has been at odds with its socialist framework. However, the last decade has seen a general opening up towards religious issues, which has been accompanied by substantial growth in Protestant churches. Pray for the vital ongoing work in leadership training and for creative ways for mission workers to meet the criteria for acquiring visas.